Poverty data offer an important way to evaluate New Jersey’s economic well being. In addition to the burden on individuals, high poverty rates impose costs on the state welfare system and slow the economic growth of the community and state as a whole. Poverty often occurs along with poor health, decreased economic opportunity, higher crime rates and other factors that reduce quality of life and inhibit economic growth. 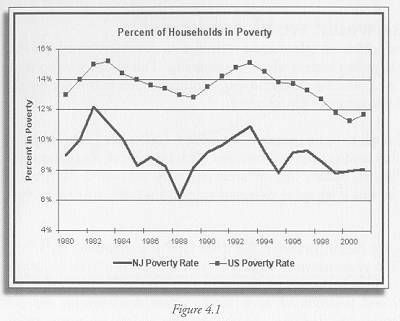 As Figure 4.1 shows, the percent of New Jersey residents living under the poverty line increased in the early 1990s to a high of 10.6 percent in 1994, and then decreased through the rest of the decade to 8 percent in 2000. New Jersey poverty rates roughly paralleled national ones, though they were not as high. This indicator measures the share of households in the state below the federally defined poverty line. The poverty line varies with the age and size of the household; in 2000, a family of four with one wage earner making $8.20/hour was considered to be at the poverty line. For comparison, New Jersey’s minimum wage is $5.15/hour, so a family of four would have to have more than one minimum-wage worker to live above the poverty line. Moreover, the poverty line is defined at the federal level, while the cost of living varies from state to state and is quite high in New Jersey. The national poverty level may therefore underestimate the income required to live in New Jersey. There is considerable racial and ethnic imbalance in poverty levels. As figure 4.2 shows, Blacks and Hispanics account for a disproportionate share of people living below the poverty line, though the gap has decreased somewhat since the mid-1990s. 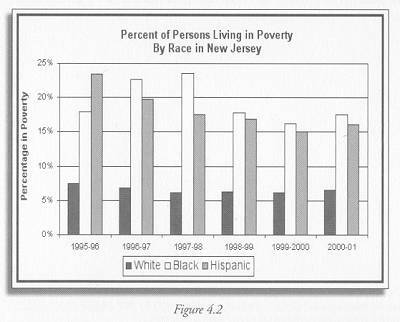 The racial and ethnic inequity compounds the threat to sustainability posed by the state’s poverty level, and must be specifically addressed in any program targeting poverty in New Jersey. The poverty line is defined in terms of the income needed to support a household with one wage earner. It would be useful to determine how many New Jersey households have only one wage earner and how many of them are living below the poverty line.